Poser likes to keep old renders around in what it calls the Render Cache. 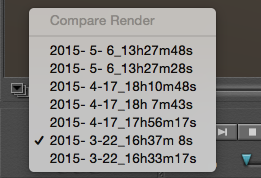 It allows you to pull up a previous render and compare it to another one. In the Render Tab, at the bottom of the screen, you’ll find a black and a white triangle icon that let you select previous renders. But this list can grow long, cluttered and out of control. Wouldn’t it be nice if there was an option to delete individual renders from this list? Yes it would be – but sadly Smith Micro haven’t implemented such a solution. There is a workaround though: curb the amount of old renders to a single one. While this won’t entirely clear the list, it will at least shorten it and delete old renders as a side effect. To do this, head over to Poser – Preferences (or Edit – General Preferences on Windows), find the Render Tab and under Cache, choose a value of one for Max render cache. As soon as you hit OK, previous renders apart from the latest one are removed. Feel free to go back and increase the same value to 25 again, which is the default. 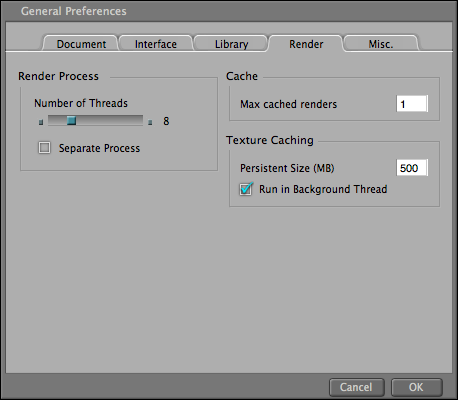 You can keep up to a maximum of 100 renders in the Render Cache. Note that you cannot choose zero as a value here. You’ll find a lot of TMP and EXR files in these folders, each of which correspond to a render you’ve once started. Great. But I have a problem, when the library was given DURING the Poser installation. Then it sticks inside library view forever… I experienced that, when the default installation process selected drive C: and not drive D: as I actually wanted. I put everything to D: by additional library path and got an empty lib for C: by this.